A sense of regret and bitterness associated with Russia’s idleness towards the uprising in Donbass traces the entire part of recollections. Pavel Gubarev believes that the Crimean scenario in South-Eastern Ukraine could have been repeated with little effort. He argues that the local elites and army could have been simply bought. “If at this point Russia opted for a ‘Crimean variant’ in Donbass, dizzying success would have awaited. The local government had no will to resist. The armed forces of Ukraine consisted of only 17,000 capable fighters in total. Even the Spetsnaz could not fight decently, as they demonstrated later in Konstantinovka. The local police were ready to give themselves up. Cities could have been taken for little money in contrast to the costs of war. The city’s local law enforcement leadership asked for 50 to 200,000 dollars for their subordination. Buyny led negotiations, but the People’s Militia didn’t have this money. So they took cities by force. (…) It was possible to buy off the police, the SBU, and chiefs of the local units of the army for a few million dollars. They did not want to meet in combat. It would have been possible to do what the US did in Iraq in 2003 when it simply bought Hussein’s generals. 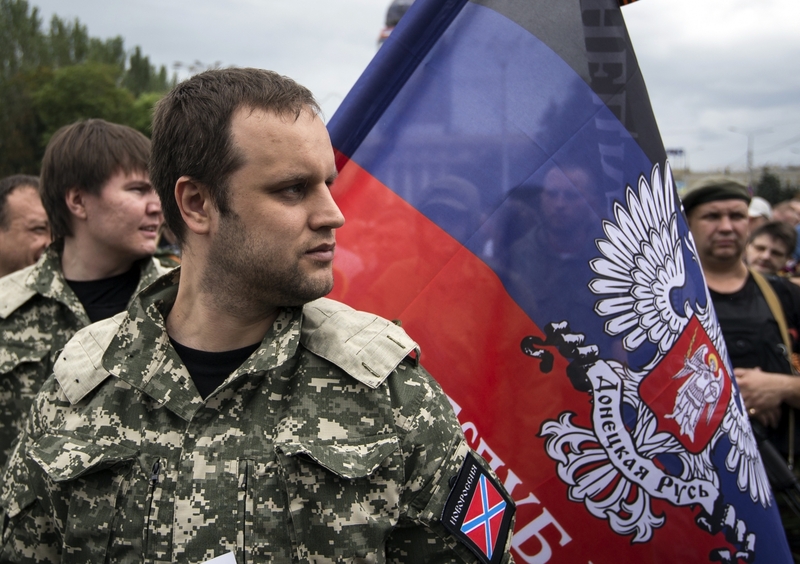 Then we would have had not only the Donetsk and Lugansk republics, but all of Novorossiya” – Gubarev maintains. In order to better understand the main provisions of Pavel Gubarev’s program, it is necessary to know his political worldview, as it transcends the usual division between right and left. The leader of the “Novorossiya” political movement declares himself to be “white-red,” i.e., Orthodox and conservative in the sphere of morality, but radically left on questions of political and socio-economic systems. This synthesis was propagandized by Gubarev through the flag of Novorossiya which contains the blue cross of the patron Saint Andrew of Russia against a red background, which is the symbol of socialist and communist movements. The starting point for Gubarev’s political mission is Novorossiya, which he considers his closest Fatherland. This was an historical region of Tsarist Russia, the boundaries of which approximately coincide with the area of South-Eastern Ukraine (although Gubarev underlines that this also includes Transnistria and the Russian regions of Rostov, the Kuban, and the Stavropol). This country, according to him, should become detached from the territory of Ukraine, to which it does not historically belong despite its proximity. Due to its economic potential, a wisely governed Novorossiya could become the center of revival of the entire Russian World, i.e., the community of the civilizational and national “Russian” peoples who include Great Russians, Little Russians/Ukrainians and Belarusians. Gubarev stands for the pre-revolutionary unity of the Russian people composed of these three elements. The separation of Novorossiya from a Ukraine suffering a worsening economic crisis and the paroxysm of anti-Russian nationalism is not considered to be a manifestation of separatism, but, on the contrary, the desire to unite the lands of the former Russian Empire and USSR – firstly through some form of reintegration of Novorossiya with the Russian Federation, and then in the long term the rest of Ukraine. He is a supporter of the restoration of the Russian Empire which he perceives as the opposite of “Khutorization,” i.e., the tendency to create small nation states out of ethnic nationalisms. The Empire, on the other hand, is a pluralist community of many nationalities who share a common, Russian civilization. “Russians have always lived peacefully and will live peacefully with indigenous peoples in this vast ecumene. In the Russian Federation (of Great Russia), we live together with Turks, Ugro-Finns, the mountain peoples of the Caucasus, and the peoples of Siberia and the North. In Novorossiya, we live with Greeks, Tatars, Gagauzi, Bulgarians, and Moldavians/Bessarabians,” Gubarev emphasizes. This unifying idea defines Russian civilizational nationalism. Gubarev sees the capitalist system as the main enemy, which he considers to be anti-Christian. The alternative is the idea of Orthodox socialism. Why Orthodox? Here the answer is simple: “Well what should it be? After all, not Buddhist, and not Muslim, because Russians are an Orthodox people by faith and culture.” According to Gubarev, the oligarchy must be destroyed as it is a “criminal element” and “our mortal enemy.” The property ruled by the oligarchs should be returned to the people because it was “constructed by the Soviet people.” However, this does not mean a complete rejection by Novorossiya of private ownership of the means of productions, especially in the form of small and medium-sized enterprises. The economy should be multi-sectored while strategic industries should remain in the hands of the state. In addition to the religious and culturally conditioned basis of socialism proposed by Gubarev, he believes that the successful realization of socialist solutions in Novorossiya will be tempting for others, not only for Ukraine and Russia, but on a global scale. This new socialism would not be a copy of the system that existed in the USSR. Although he appreciates the social and state-building achievements of the Soviet Union, he considers the bureaucratic system prevailing in the Soviet state to be the reason for its collapse. The new socialist state would be based on the principle of government by the people realized through a system of territorial government councils with elements of direct democracy. Gubarev claims that modern parliamentary elections in capitalist countries are fraudulent because only those who have massive money at their disposal can win. People’s power in politics must be complemented by people’s power in the economy. “One without the other is dead, ephemeral, and short-lived,” he says. Institutions for workers’ self-management in the public sector, the private sector, as well as the social sector would represent the foundations of such economic democracy. “Novorossiya will be a country of new soviets, a country of ceaseless people’s power and as such will be a country of economic democracy. It will be a country in which Justice prevails,” Gubarev prophesies. In his book, Pavel Gubarev presents a lot of detailed, interesting systemic solutions, first and foremost in the sphere of enterprise management and economic planning, weapons being a necessity. On the question of management, he refers to interesting solutions tested with certain success during the times of the USSR such as the “authentic formula,”, the non-state cooperatives of Mohammed Chartaev in the ’80’s, and the “Compass” system of Valery Vodyanov which allows the crews of enterprises the right to decide on a portion of the wage fund. He proposes to establish economic planning across the state based on the cyber system “Cybersyn” which was introduced by the British scientist Stafford Beer during the reign of Salvador Allende. “We can pick up the banner of the great Stafford Beer who worked on the ‘Cybersyn’ project and the system of planning and people’s government for Chile where national-democratic forces headed by Salvador Allende won in 1970,” Gubarev states. “We have proposed the economic system of socialism, and if not for the military influence on the situation by the West…(…) this situation would have been resolved by economic methods, and not by military or political pressure. Otherwise, the entire world would already be socialist, because it is the best system. (…)Of course, we like socialism,” he said in an interview. It is clear that this is a socialism without the Marxist, materialist framework. That being said, the attempt to connect socialist ideas with Christianity can also be found in Latin America, where its strongest expression is the Chavista idea of Socialism of the 21st Century. Regarding the recollections section, one can say that the author is a bit silent on the other political forces and groupings which participated in the anti-oligarchical uprising such as the organization “Oplot”, the progressive socialists, one of whose leaders, Alexander Kharitonov, became the first People’s Governor of Lugansk, and the communists of Donbass thanks to whom the Donetsk People’s Republic’s declaration of sovereignty adopted such a socialist face as that which is dear to Gubarev. One can, however, understand such an approach seeing as how the essence of the book is the quite subjective record of events as seen from the perspective of Pavel Gubarev himself and his closest associates. It does not aspire to the rank of being a comprehensive account of the crucial historical moment in which Donbass had its place in 2014.